Credit Card Processing Services, Inc. is a registered ISO/MSP of HSBC Bank USA, NA, Buffalo, NY and as such we follow a strict guideline of business ethics and have gone through a thorough review process with MasterCard and Visa. In addition, our business practices are reviewed annually by our sponsoring bank as are all registered association members. In addition, Credit Card Processing Services, Inc. is a long-term member of the Central Bucks Chamber of Commerce which shows our commitment to serving an honest role within the business community. We do not collect or save any of your personal or business information that is not directly pertinent to processing your order for credit card equipment or applying for a merchant account. Once we receive your order the information is not saved on any PC or server. Credit Card Processing Services will never provide, sell, or rent any of your information to any third-party not directly related to the transaction either for money or for free. In the case of equipment we may provide your shipping address to the company that fulfills and ships your order. Your personal, business, and credit card information is not provided to them. Keeping your private information private and secure is extremely important to us. That is why our website and server is protected by a Thawte certificate which is a recognized leader in security certification. Credit Card Processing Services will only use your email address to communicate with you directly regarding orders you have placed or in regards to setting up your merchant account. We never provide your email address to any third party not directly related to these internal transactions. We take your privacy seriously. Cookies are a technology which can be used to provide you with tailored information from a website. A cookie is an element of data that a website can send to your browser which then can in turn be stored on your system. We, and most websites, utilize cookie technology to help provide you with a better user experience. You can set your browser to notify you when you receive a cookie, giving you the chance to decide whether to accept it. Our ordering system may make use of the cookie to facilitate your order to insure correctness of the information. As previously mentioned no information collected as a result of cookies is every revealed to non-involved third parties. 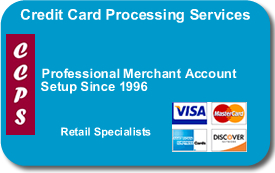 How can I contact Credit Card Processing Services?